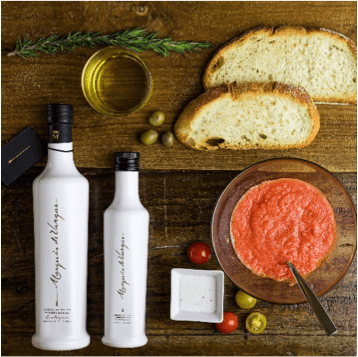 Marqués de Vargas expands its horizons and launches a new Olive Oil Organic Extra Virgin brand, with a very traditional product of La Rioja. This new line has been developed with great delicacy, surrounding himself with the best experts and following a strict production process to get this oil with excellent results. Among the features of this new Extra Virgin Olive Oil, Marqués de Vargas emphasizes its ecological character and its development of Coupage, as a mixture of Arbequina and Royuela. Aberquina oil is considered one of the most exquisite, because of its marked fruity and slightly pronounced bitterness and pungency. These flavours leave a sweet feeling, very accustomed to the taste of less consumption of olive oil tastes. On the other hand, oil Royuela known for its richness in bitter and pungent features. The new Extra Virgin Olive Oil Ecological Marqués de Vargas, is D.O.P. Oil Rioja, where the oil with the designation of origin is the result of good work of La Rioja processors and adaptation to modern systems development and culture. Oil La Rioja has very different characteristics, its distinction is conferred by the weather and the type of soil conditions of the region. In appearance, it has a fatty, clean and bright liquid, yellowish green. Its aroma or flavour is fruity, pleasant and intense with aftertaste of almond and artichoke. The palate is something sweet and nutty, a medium bitterness and pungency. An excellent combination where Royuela brings more complexity to the Aberquina. In the process, the Extra Virgin Olive Oil Ecological Marqués de Vargas experiences a cold extraction by mechanical means.